The Philadelphia Building & Construction Trades Council will once again be hosting the annual All-Star Labor Classic, which showcases the region's top high-school basketball talents and features a game of Building Trades' officials squaring off against local media celebrities. This year's event will be Sunday, April 14th from 10:30 a.m. to 4 p.m. at the University of Sciences in Philadelphia (600 South 43rd Street). The Building Trades, led by Business Manager John J. Dougherty, has selected the Greater Delaware Valley Chapter of the National Multiple Sclerosis (MS) Society as the new beneficiary of the monies raised from the event. This year's All-Star Labor Classic, celebrating its 32nd year, will feature former Penn and Temple Men's Basketball Coach Fran Dunphy and former LaSalle College Men's Basketball Coach John Giannini as guest speakers. 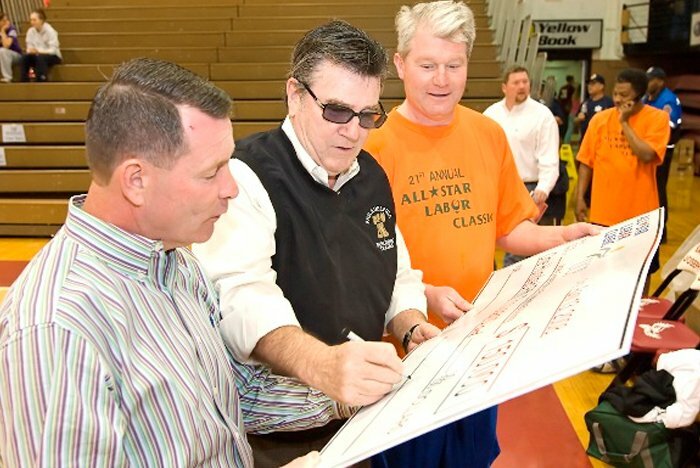 "We are extremely pleased to be partnering with the Greater Delaware Valley Chapter of the National Multiple Sclerosis Society for this year's All-Star Labor Classic," said Philadelphia Building Trades Business Manager John J. Dougherty. "When our committee began studying regional non-profits, it quickly became apparent that the local chapter of the National MS Society is very highly-regarded in non-profit circles. Also, the more we talked, the more apparent it became that many of us have a dear friend or family member who's afflicted with MS. When we added all of those factors up, the decision to choose the MS Society as our new beneficiary was easy." Multiple Sclerosis, or MS, is an unpredictable, often disabling disease of the central nervous system that disrupts the flow of information within the brain, and between the brain and the body. MS occurs when a person's immune system attacks a fatty material called myelin, which wraps around the nerve fibers to protect them. Without this outer shell, the nerves become damaged and scar tissue may form. Multiple sclerosis causes many different symptoms, including vision loss, pain, fatigue, spasticity, impaired coordination and, in severe cases, paralysis and loss of mobility. The symptoms, severity, and duration can vary from person to person. Some people may be symptom free most of their lives, while others can have severe chronic symptoms that never go away. There is no cure for Multiple Sclerosis. For more information on the 2019 All-Star Labor Classic, including tickets and sponsorship opportunities, visit the Philadelphia Building Trades website at www.philadelphiabuildingtrades.com. For more information on the National Multiple Sclerosis Society, visit www.nationalmssociety.org.